Rejman D., Pohl R., Bartůněk P., Ribeiro Pombinho A. J., Krásný L., Látal T.
Growing antimicrobial resistance to currently available antibiotics poses a major threat to public health worldwide and presents an urgent need for novel effective antimicrobial compounds. We present a novel class of compounds that selectively target the bacterial membrane. The compounds show significant inhibitory and bactericidal activities against a broad spectrum of clinically relevant Gram-positive and Gram-negative pathogens, including resistant strains. At their lowest bactericidal concentrations, the compounds do not damage eukaryotic cell membranes. In vivo, they show no toxic effects up to a dose of 2000 mg/kg (when administered orally to mice). An important asset of these compounds consists in their low potential for inducing bacterial resistance. Further advantages include simple synthesis and modular structure, allowing for optimization of their biological properties. The project is offered for co-development, licensing and research collaboration. Synthetic methods for preparation of gram amounts of the title compounds have been developed. Antibacterial activity of a series of compounds has been determined using standard microdilution method (in vitro). Cytotoxicity of the compounds has been determined (in vitro, erythroid progenitor cells). It was also determined that the most promising compounds are not genotoxic. The mechanism of action of these compounds has been studied intensively for the last two years. There are strong evidences that these compounds selectively disrupt bacterial cell membrane. 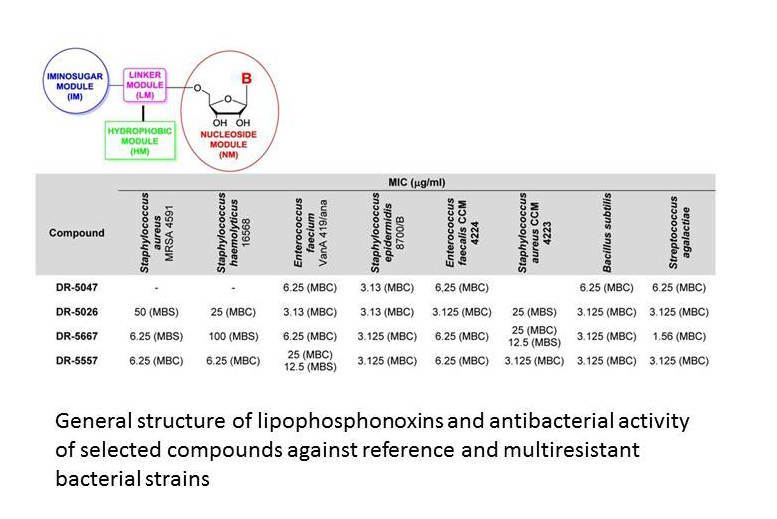 We were able to produce resistant strain against one of two selected most active lipophosphonoxins but we were not able to form resistant strain against the other compound. MTD tests in mouse models are currently under way. Development of selective growth media utilizing lipophosphonoxins as an antibacterial supplement is currently under way. Preclinical stage – in vitro and in vivo testing, lead optimization, toxicology. Protected by EP 2 527 351 B1, 11.12.2013, 2013. Institute of Molecular Genetics AS CR, v.v.i. Institute of Microbiology AS CR, v.v.i.